You have 0 items in your cart. 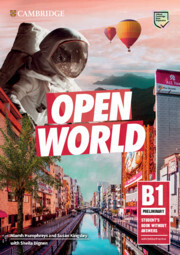 Embark on a journey beyond the traditional boundaries between exam preparation and real-world language with Open World Preliminary. A unique exam journey in the Student's Book maximises students' performance. Exam Training tasks build confidence allowing them to progress to full task practice in the Exam focus. Real World sections open up language knowledge with listenings, videos and texts introducing common yet surprising expression, while mobile animations spark learning before or after class with Grammar on the move. Optional Push yourself sections throughout the book extend students' capability and confidence to B2 First level. Online Practice offers additional practice in grammar and vocabulary. Downloadable Class Audio containing the necessary listening material is provided with the Teacher's Book. Prepare! is a lively 7-level general English course with comprehensive Cambridge English for Schools exam preparation integrated throughout. Thank you for your feedback which will help us improve our service. If you requested a response, we will make sure to get back to you shortly. Please fill in the required fields in your feedback submission.